Pull out your old wedding dress or tuxedo from the attic, throw on that party dress you haven’t had a chance to wear, or wear your favorite party outfit! 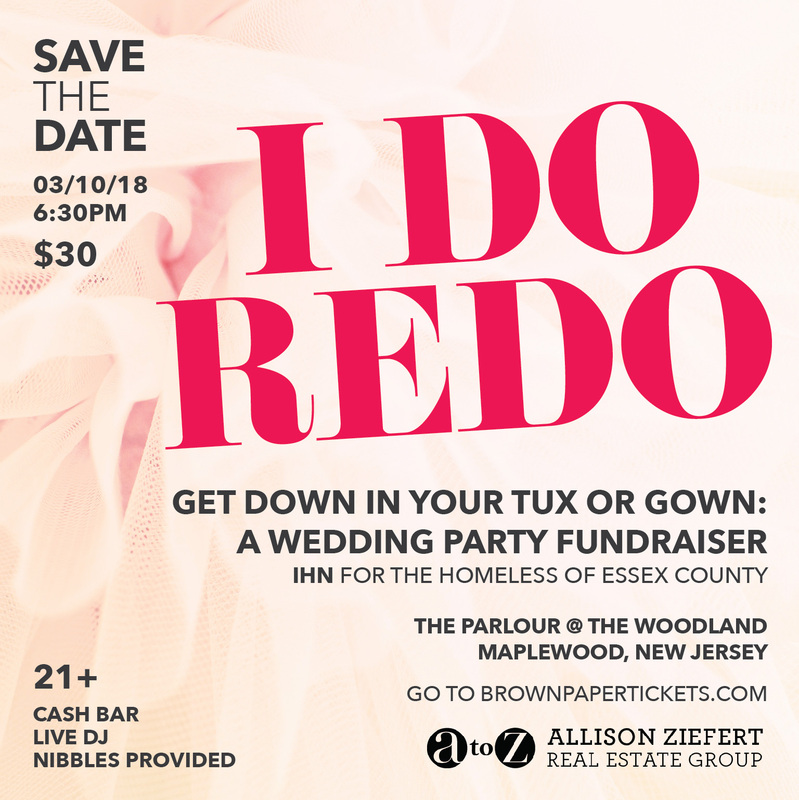 Then, head on down to The Parlor @The Woodland in Maplewood on March 10th for a night of drinks and dancing at the I Do Redo – A Wedding Party Fundraiser for Interfaith Hospitality Network hosted by Ginge Calhoun of the Allison Ziefert Real Estate Group. Have some fun raising funds for homeless families in Essex County! All proceeds benefit families in a housing crisis served by IHN. The idea for a wedding dress party came about one night as Ginge and a friend relaxed with a glass of wine and reminisced about dating and life pre-children. “The conversation moved quickly to our fabulous weddings and the beautiful dresses now stored safely away in our attics,” Ginge explained. Ginge does pull her dress out once a year to wear around the house as she does her everyday activities, and also to be sure it still fits after nine years of marriage. So Ginge and her friend decided it would be a GREAT idea to get their dresses out and have a little party! Photos from that fun evening were posted on social media, and they received so many “likes” and comments that Ginge knew she needed to host the party on a larger scale and really wanted it to have a charitable benefit. The Allison Ziefert Real Estate Group has partnered with Interfaith Hospitality Network of Essex County in order to focus their giving and really have an impact. Ginge explains, “The issue of homelessness in our community is such a stunning parallel to what we do everyday, and it is easy to forget that, in our own county, there are many families that are less fortunate. As a group, we are working on events, collections (we just collected PJs from our office), and we also donate to IHN each time we have a closing.” So Ginge chose to have all proceeds of this fun event go to IHN. What will I wear? : Walk down memory lane and come in your wedding attire, or party attire of choice. If it doesn’t fit……..duck tape? Binder clips? Tank Top underneath? Oh, the veil fits though! Wear that! Head to a thrift store with a friend! Wear your bridesmaid/groomsmen outfit OR wear your favorite party frock! What else? : Cash bar – so bring cash. Where does the $$ go? : The proceeds of this fun event will be donated to Interfaith Hospitality Network for the Homeless of Essex County. $20 of your ticket price, plus contributions, are tax deductible!